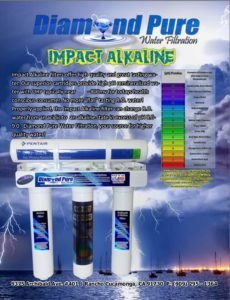 Alkaline water, also known as ionized water, has a higher pH than regular tap water — which means it’s less acidic. While alkaline diets might seem to be just another fad, you may actually reap some health benefits from drinking alkaline water. Because of the high pH value of alkaline water, it may help improve symptoms of gastroesophogeal reflux disease. According to a study published in 2012 in The Annals of Otology, Rhinology, and Laryngology, typical tap and bottled waters have pH balances of 6.7 to 7.4, but alkaline drinking water has a pH of 8.8 and helps buffer hydrochloric acid in your stomach. This process could help improve unpleasant symptoms of gastroesophogeal reflux disease, and reduce damage to the larynx and esophagus caused by the disease. Alkaline water may also help improve symptoms of metabolic acidosis, which occurs when there is too much acid in body fluids. Possible causes of metabolic acidosis include uncontrolled type 1 diabetes, severe diarrhea, high-intensity exercise, liver failure, certain medications, alcohol, cancer, heart failure, anemia, kidney disease, seizures and severe dehydration, according to MedlinePlus. A study published in 2009 in Therapeutic Apheresis and Dialysis reports that ionized alkaline water helps manage metabolic acidosis in animals, and could also be effective in humans. Alkaline water may help slow bone loss, according to Mayo Clinic. One study published in 2009 in the journal Bone reports that alkaline mineral water helped reduce the risk for bone loss in young women with adequate calcium intakes. However, Mayo Clinic notes that more research is needed to help determine if alkaline water is beneficial for bone health long term. A review published in 2012 in theJournal of Environmental and Public Health reports that while alkaline diets appear to reduce calcium losses in urine, these diets may not actually protect against osteoporosis. Drinking alkaline water and following alkaline diets to decrease acidity has the potential for other possible health benefits, but more research is needed to know for sure. The 2012 review in the Journal of Environmental and Public Health reports that alkaline diets may increase growth hormone, preserve muscle mass in older adults — and improve body composition, cognition and heart health.